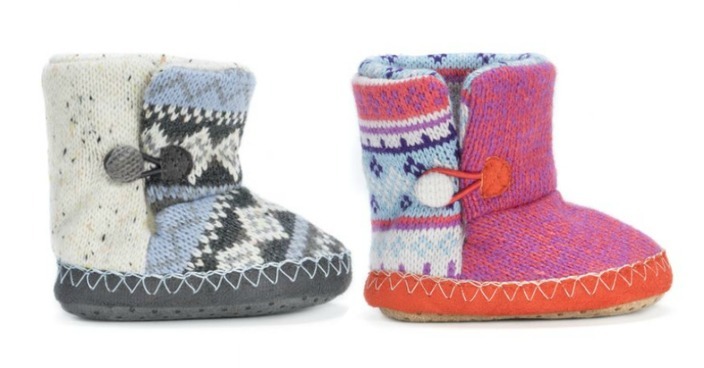 Baby Muk Luk Booties Just $15.99! Down From $36! Ships FREE! You are here: Home / Great Deals / Baby Muk Luk Booties Just $15.99! Down From $36! Ships FREE! Tanga has these Baby Muk Luk Booties for just $15.99 (Reg. $36)! Keep your little miracles cozy and warm with MUK LUKS baby slippers. Choose from various adorable knit patterns. Sizes include INF1 (0-6 mo. ), INF2 (6-12 mo. ), INF3 (12-18 mo. ), and INF4 (18-24 mo.) in pink, grey, multi, black and dark red colors. Easy care instructions to keep their growing happy feet comfortable. Machine wash on cold, gentle cycle, no bleach, lay flat to dry.